Alberobello is a fascinating place to visit, above all because of the trulli, the traditional dome shaped buildings made from the local stone. The town is surrounded by the olive groves and vineyards typical of the Pugli region. Trulli is a word that derives from the Greek "tholos" (trans: "dome"), the typical shape of the buildings. Each whitewashed “trullo” is built without an lime or cement, and has a conical roof on the outside, which is dome shaped inside, and consists of a square central compartment that communicates through arcades with the kitchen and other rooms. You will see trulli throughout the countryside of the region but there are more in Alberobeloo than anywhere else (more than 1000) and because of this the town is now a listed UNESCO World Heritage Site. Your visit to Alberobello can start with the 'trulli' in the central area of the town between the Aia Piccola District and Piazza del Popolo. There are many to be seen which make the streets of the ancient village centre a very interesting and unusual region to explore. The fully restored group of trulli here can be visited by tourists, the oldest of which date back to the 14th-18th century, and is the main attraction in Alberobello. The village does attract a great deal of visitors so we suggest you visit quite early in the day or slightly out of high season if possible. The tallest and biggest trulli is the so-called 'Sovereign Trullo', a two storey building located in a small square behind the Cathedral Church that plays host to cultural events and entertainments during the summer. Truly unique and in some respects similar in shape to the trulli of Alberobello is the Church of San Antonio. In 2004 the Church, in the form of a Greek cross, underwent a complete restoration. On the cruciform of the church there is a 21 metre high dome in the shape of a “trullo”, which integrates perfectly with the surrounding buildings. As well as the trulli Alberobello has other interesting monuments such as the pretty Saint Medici church. As well as its houses the town of Alberobello is very tied to ancient traditions and has developed a flourishing handicraft industry, especially related to the manufacture of iron, the production of baskets in olive wood, and the production of a renowned wine and oil. For those who love folklore, in Alberobello every year there are feasts linked to the town's history, such as that which takes place among the Trulli and recalls the the liberation of the residents from feudal servitude in 1797. The town held its first Assembly under a big tree next to the church, where the first mayor was elected and at which it was decided to keep the old name "arboris belli", changing it in Alberobello, in tribute to the great oak tree (tree:arboris) below which they had gathered to gain their freedom. The municipal coat of arms also recalls this event, with a large oak tree beneath which a Knight, armed with armour fights with a rampant lion (representing the feudalism). About the oak fly two doves, symbols of love and peace. The area around Alberobello is very charming and full of farms where you can enjoy not only the landscape, but also the local cuisine. The supremacy goes to the hand-made pasta, produced in many varieties such as the “orecchiette”, “laganelle”, “lasagne”, and “strascinate”. Among the first courses to enjoy we suggest the "green" soup (with cabbage, celery, chard, fennel and pork broth), mashed Fava Beans and broad beans and chicory soup. The local breads are also excellent (taralli, buns, stuffed pizzas). You can also enjoy the dairy products, especially the "manteche" and the “burrate”. Among the main dishes local to the region are the "gnemeridde", offal of lamb or kid, cut into strips and wrapped in a ball with guts, and finally the "turde 'n zulze" (thrush in jelly), cooked and preserved in dry white wine. The typical specialities of sweets at Alberobello are the so-called "pettole" (rustic fritters of sweet dough), the "cartellate" (paste composed of flour, sugar, marsala, honey, cinnamon, oil and a little liquor, used at Christmas time) and the “amaretti”. See also history of Alberobello. Alberobello is located at 426 metres above sea level, on two hills at just over 20 kilometres from the Adriatic Sea in Apulia at the top of the 'heel' of southern Italy. It is on the northern edge of the Salentina Peninsula, and north of Taranto. You can see more trulli in the nearby town of Locorotondo., while the caves at Castellana are also very impressive and worth visiting. Not to be missed! Locorotondo is famous for its quaint cottages called 'trulli'. Ostuni is known as the 'White City' for its lovely white-washed buildings. Sitting on the edge of the sea, Taranto's impressive castle dominates the old town. 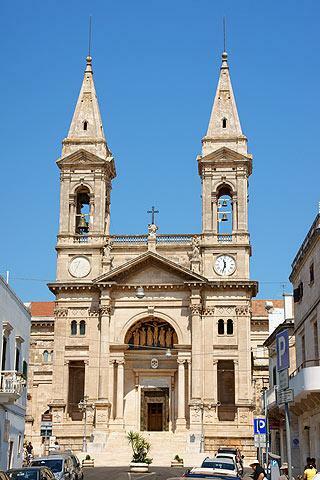 Bari is a coastal city with an interesting historic centre. Bitonto is a pretty town with some important museums and archaeological sites.